With the plethora of injuries to the Brew Crew in this spring training it seems prudent to take a look at the man some consider to have a chance at winning the No. 5 starter spot to start the season: Wily Peralta. Peralta, who turned 22 on the 8th of this month, was signed as a non-drafted free agent in 2005. At 6'2" and 225 he doesn't carry the frame of a typical power pitcher but he does have a live arm nonetheless. Peralta's fastball has been consistently in the 93-95 MPH range and he has a plus breaking pitch. His change-up needs some work and will ultimately determine whether he is a starter or a reliever. 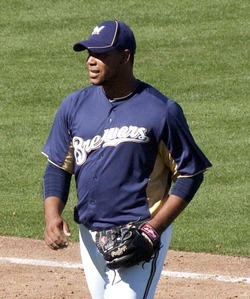 Starting his career with the Arizona Rookie Brewers in 2006, Peralta struggled to a 6.63 ERA that year. In the following season he did not pitch due to injury. 2008 was a much better season, when Peralta started with rookie league Helena and pitched his way up to Low-A. 2009 was the season that really put him on the radar screen of scouts and prospectors. Pitching for Wisconsin in the Midwest league, he struck out 118 batters in 103.2 innings pitched and put up a 3.47 ERA. Combined with good velocity and strikeout stuff he found himself a consensus top 15 prospect. Last season Peralta split his season between High-A Brevard County and Double-A almost exclusively as a starter. He put up a 3.79 ERA and pitched 147.1 innings, solid numbers and he actually pitched better after his promotion. Not a perfect season by any stretch though, more on that later. One area that stands out is Peralta's ability to strike batters out. As mentioned earlier he struck out 118 batters in just over 103 innings in 2009. His strikeout numbers took a dip last year but he still struck out 104, the stuff is definitely there. Also, Peralta has seen his innings counts steadily rise after missing a season due to injury. His inning counts have gone up and he has stayed healthy. Any starter who can strike guys out and pitch over 150 innings has value and Peralta looks like he could be one of those players. Another area that holds some promise is his ability to keep the ball down and keep the ball in the ballpark. In 2009 he gave up just five homers in over a hundred innings and last year he gave up only 10 homers in nearly 150 innings. At every level he has consistently recorded more outs by ground balls then fly balls. Walks have been a consistent problem the last two seasons for Peralta. In 2009 he walked 46 batters and followed that up with 64 in 2010. Those are just bad numbers, there really is no way around that. The walks played a major part in his 1.58 WHIP with Huntsville last year. Peralta's got good stuff, but if his is nibbling in the minors he'll get eaten up in the big leagues. Area number one to watch for Peralta in 2011 is his walk rate. Less walks would likely lead to more innings this season and would also make him a legitimate major league starter. There seems to be little doubt that Wily Peralta will be a Major League pitcher but there is a fair amount of question as to what role he will play when he gets there. He has the arm to be a closer or set-up pitcher but if he can continue to develop his third pitch he could also be a very good starter. Milwaukee will give him all the chances in the world to be a starting pitcher, but they also have a good number of legitimate pitching prospects at the Double-A and Triple-A levels. Look for Peralta to pitch at Triple-A next year and with marked improvement he could find his way into the rotation by the end of the season or the start of next (sorry Chris Narveson).